I’ve been spending a lot of time in New York, working on my next book, so I haven’t done much hiking in Pennsylvania. However, I stayed home this past weekend and decided to do some hiking in the Loyalsock State Forest, one of my favorite areas. The state forest covers over 114,000 acres and combined with the surrounding state game lands, is one of the most scenic, diverse, and impressive areas of public lands in the Mid-Atlantic. We decided to do the 5 mile Rusty Falls and Shanerburg Run Loop. This is hike no. 40 in Hiking the Endless Mountains. This is a wonderful hike, not hard at all, that features pristine trout streams, diverse forests, a meadow, and Rusty Falls. The hike begins off of Shanerburg Road and follows an old forest grade. The forest is very diverse with pine, hemlock, and spruce. 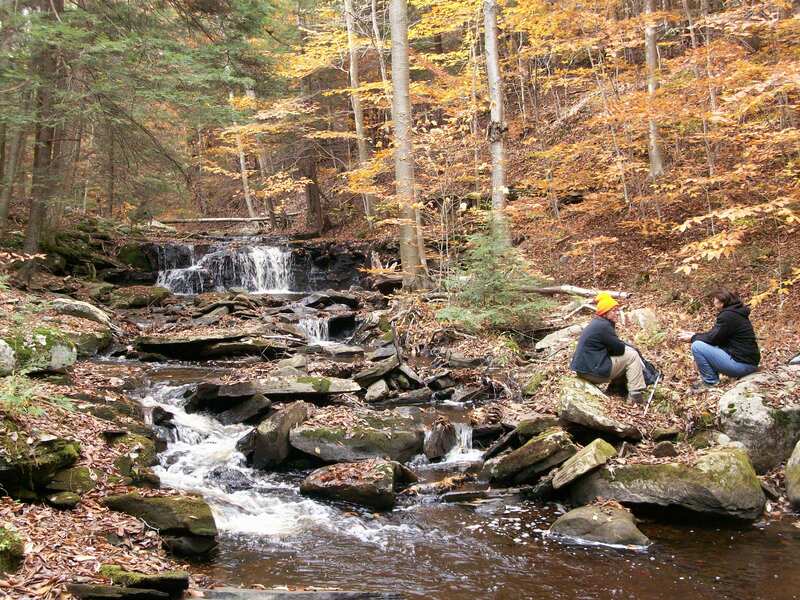 The trail crosses Shanerburg Run several times; the run is a pristine trout stream. We hiked across a meadow with some old apply trees. This was the site of a homestead. Tunnels through hemlock saplings soon followed. The trail then followed the creek, passing some slides and small pools. We entered a hemlock forest and climbed to a logging road. The road was in good shape and we took a side trail to the left that went to Rusty Falls. There are two drops, no more than a total of 20 feet high. The falls are very scenic. We walked out to Shanerburg Road and returned to the car. Next we ate at the Forksville Inn and then took a drive to High Knob Overlook, stopping by beautiful Dry Run Falls along the way. As I took pictures of the falls, another car drove by, backed up to see what I was looking at, and then the driver and passengers got out to enjoy the falls. The overlook was impressive. Rain showers passed overhead as deep, dark clouds contrasted against the yellow fall foliage. The foliage was past peak, but it was still beautiful. Shafts of sunlight glowed in the distance against the veils of mist and rain.